Book Condition: Supplements such as cds and access codes may not be present, contains writings, highlightings and underwritings, your satisfaction is our priority buy with confidence. Comment: Supplements such as cds and access codes may not be present, contains writings, highlightings and underwritings, your satisfaction is our priority buy with confidence. Ships from and sold by IIRP. Christine E. Sleeter is professor emerita at the College of Professional Studies, California State University, Monterey Bay, and president of the National Association for Multicultural Education. 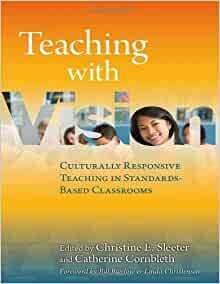 Her recent books include Teaching with Vision (edited with Catherine Cornbleth).Catherine Cornbleth is professor at the Graduate School of Education, University at Buffalo, State University of New York (SUNY) . Her books include Diversity and the New Teacher. 5.0 out of 5 starsRefreshing! I loved this book. It was extremely refreshing and inspirational. It was so much easier to read about the perspectives from actual teachers compared to the many purely theoretical textbooks in education.